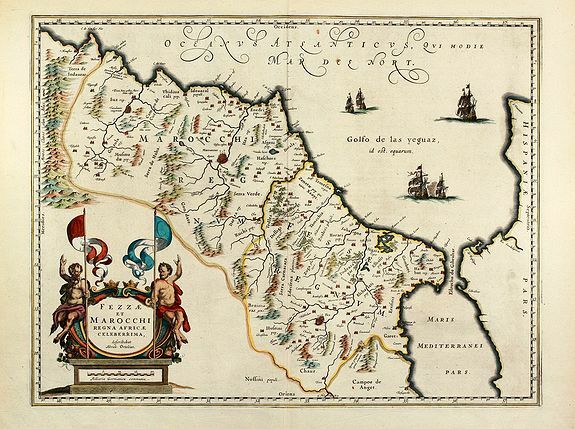 Fezzae et Marocchi regna Africae celeberrima - BLAEU, W.J. Title : Fezzae et Marocchi regna Africae celeberrima. Size : 15.0 x 19.4 inches. / 38.2 x 49.2 cm. Description :Old coloured map of Morocco by W. Blaeu. With the Strait of Gibraltar, several sailing ships and a large figural cartouche. The map is based on Ortelius map of 1570. From 'Atlas Major' around 1640, with Latin text on verso. Condition : Very good condition in attractive colours.